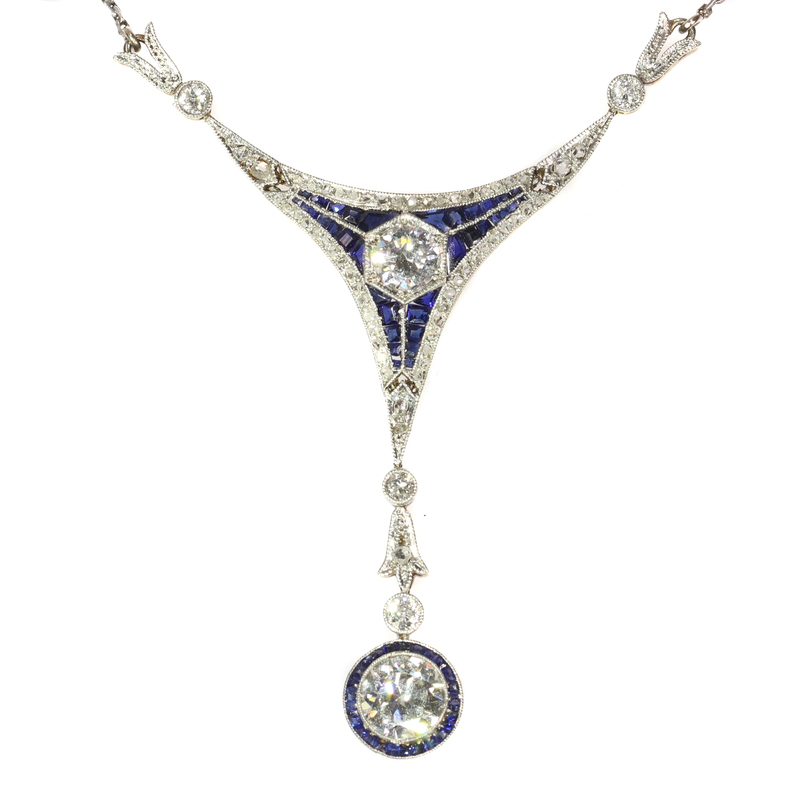 Art Deco Belle Epoque pendant with big brilliants and calibrated sapphires: Description by Adin Antique Jewelry. This refined platinum necklace with an 18K yellow gold back is a typical Art Deco triangle elaborated by a suspension of an old European cut diamond encircled by 36 carré cut sapphires. An outer trilateral alignment of rose cut diamonds intensifies another 36 sapphires, which are rail set from each corner to the central hexagonal encrusted old European cut diamond. Furthermore, every hinging peak is topped off by a platinum tulip embedded on an old mine brilliant cut diamond. Imagine all this splendour flaring around your neck on any stylish occasion. Style: Something between Art Deco and Belle Époque - Art Deco is an eclectic artistic and design style which had its origins in Paris in the first decades of the 20th century. The style originated in the 1920s and continued to be employed until after World War II. The term "art deco" first saw wide use after an exhibition in 1966, referring to the 1925 Exposition Internationale des Arts Décoratifs et Industriels Modernes that was the culmination of high-end style moderne in Paris. Led by the best designers in the decorative arts such as fashion, and interior design, Art Deco affected all areas of design throughout the 1920s and 1930s, including architecture and industrial design, as well as the visual arts such as painting, the graphic arts and film. At the time, this style was seen as elegant, glamorous, functional and modern. - See also: Art Deco. Diamonds: One old European cut diamond with an estimated weight of approx. 0.85 crt. (approximate color and clarity: J, si) One old European cut diamond with an estimated weight of approx. 0.45 crt. (approximate color and clarity: H, vs) and 4 smaller old European cut diamonds with a total estimated weight of approx. 0.20 crt. 55 rose cut diamonds and senailles . A senaille is a simplified rose cut diamond, a small diamond chip with perhaps a few polished facets. We do not have the weight of the rose cuts diamonds nor the senailles which is normal in our trade when it comes to rose cut diamonds and senailles. Precious stones: 62 carre cut sapphires . We did not check if the sapphires are lab produced or not as this information has no influence on the value of this jewel. Natural sapphires and lab produced sapphires were both used in this era, rather more for their effect than for their intrinsic value.